Short-term parking is available in our parking lot designated for trucks on the outskirts of our property. Although you can park with the trucks in the gravel lot next to the bridge RV's are also allowed in the paved lot closer to the casino. Large open lot next to truck parking. See Google satellite image for reference. 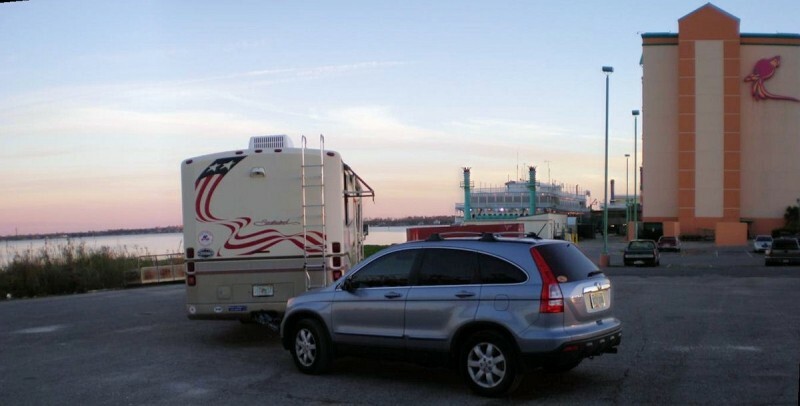 We offer an eight-space RV park with 40ft x 9ft spaces with 30/50amp electric hook-ups. Water and sewer hook-ups are not available. Cost is $25 per night Sunday - Thursday and $30 a night on Friday and Saturday. Staying at the RV Park includes access to our fitness facility (with bathrooms and showers), outdoor pool and hot tub. Reservations can be made by calling 1-800-THE-ISLE; guests can check-in at the hotel tower’s front desk. There are eight pull-through RV 40ft x 9ft spaces with 30/50amp electric hook-ups. Water and sewer hook-ups are not available. Cost is $25 per night Sunday - Thursday and $30 a night on Friday and Saturday. Isle of Capri Casino in Lake Charles, La. opened in 1995 and is dedicated to providing its customers with an exceptional, fun, gaming and entertainment experience. With over 45,000 square feet of gaming space on two riverboats, the casino offers guests more than 1,800 slot machines; 50 table games; a 28 table poker room; four restaurants; and 491 hotel rooms. Just made reservation for Thanksgiving 2018, and the nightly cost is now $25 per night, plus tax, plus the $50 deposit which is refunded upon departure. Campsite still is only electric, plus access to the amenities mentioned previously. Pull thru, 30 or 50 amp. No dump or water.Tight fit but our 34ft did just fine. $22.00 including tax. $50 incidental added to amount,but taken off at checkout. Shower,weight room and hot tub included. Free alcohol in the casino. Machines were good to me. $15 Free play for new customers after spending a few dollars.Noise from the overhead bridge wasn't bad that night and only a couple trains. We will stop again. Can't comment on the dining. We pulled in at 9pm on New Years Eve. The casino was packed, and the RV lot had a lot of employee cars. We were able to park right along the Lake in nearly the same spot as the previous reviewer shows in pictures. The RV parking lot is not well signed - we first deviated toward truck parking, so when you come up to the casino, go straight through the stop sign, don't turn left toward truck parking. The RV lot will then be on your left. We thought this was a fabulous stay - to pull in on New Year's Eve and get a spot, we'd guess you could get one any day of the year. The view was fabulous of Lake Charles in the morning. The parking lot fills around you, so if you pull in and park, you are there until morning because you'll be blocked in for sure. By 7am the lot was nearly clear. The seafood buffet was worth the price ($19.99) - lots of crablegs, shrimp, etc. The buildings are "tired" but clean. Yes, its loud - the train will come through a couple of times a night and shake the rig, and the traffic overhead is constant, but all in all we thought this was one of the nicest overnights we've had. We spent a couple nights here and used the $10 per night hook-up, electricity only. The spaces are very close together and really tight for big rigs. Easy walk to the casino especially if you cut through the employee area. The best feature of this stop was access to the fitness facility. In addition to work out equipment there were nice showers and they furnished the towels, soap, shampoo, lotion, etc. The casino has a number of full pay video poker machines. We tried the buffet for lunch and it was pretty bad. Cannot recommend it at all.